One month later. . .
We are finally moving in you guys! Although we are not quite finished with phase one of our renos, we are pretty close. . . and at this point, we just want to be in our home for Christmas! So what did we get done from Phase One of #TheModHouseProject? Well, we were able to replace all the flooring on both levels of our house. This felt like a never ending task but we did it! 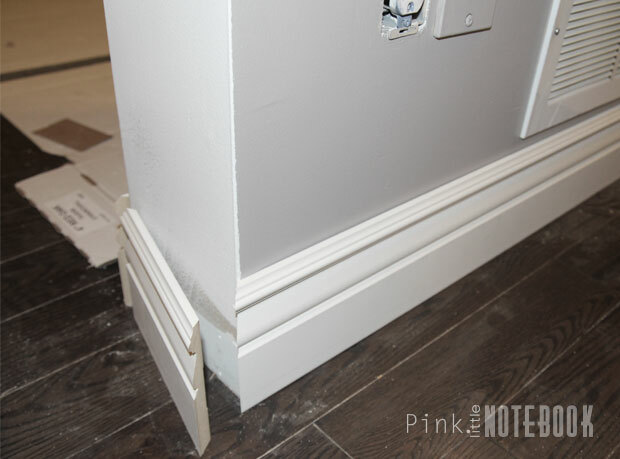 We also got in new baseboards on the main floor and cut everything to size. However, nothing is nailed in yet. We figured we would leave as is until we finished painting. It will save us from the tedious job of taping. We got our kitchen in! The countertops are actually being installed today, however, we still have a ton of finishing touches to add to this space. Plus we are waiting on a few out-of-stock drawer fronts to be delivered from IKEA. We started painting the main floor and I found the most awesome grey ever! Words nor this picture below can describe how warm and inviting it looks with dark floors. 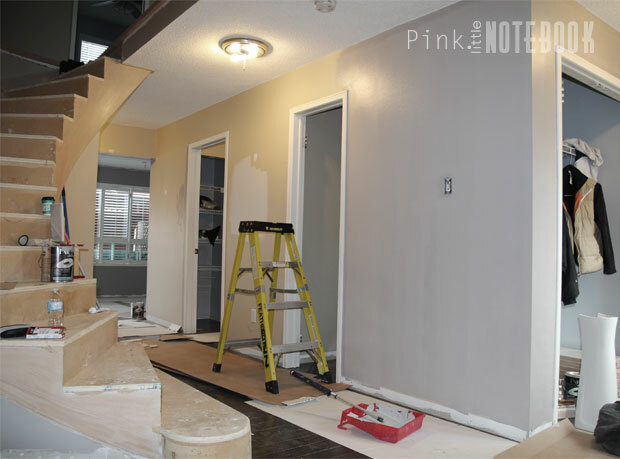 F-Stop by Para Paints (p5243-44) just made it to my number one spot for favourite paint colour! Unfortunately we didn’t get a chance to complete our staircase. 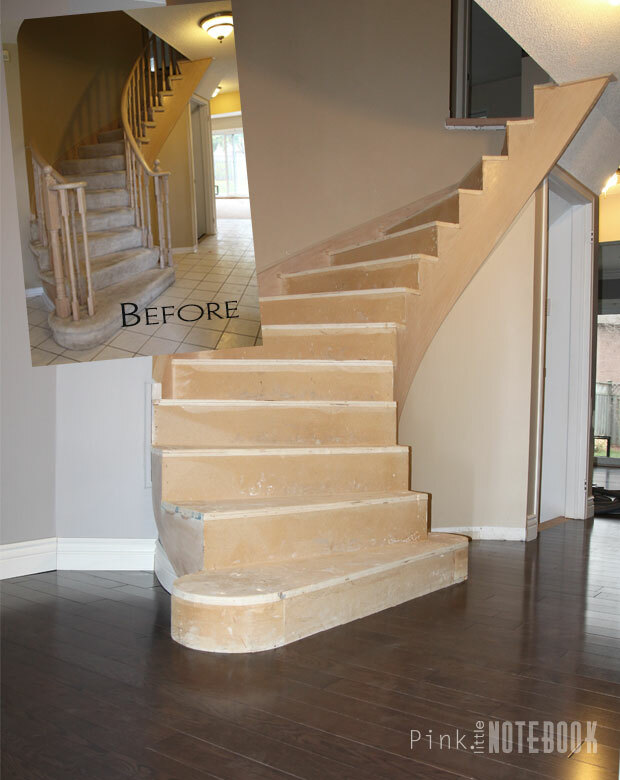 It still remains bear at this point and all the stair treads are sitting in my basement waiting to be stained. Not going to lie, we contemplated whether or not we should just hire someone for the job. We still don’ t know which direction we are going to take. We push ourselves hard this past month and look forward to slowing down the pace just a bit. Now that we will be living in the home, we can tackle one room at a time to make things a little more manageable with our daily life. It’s finally starting to take shape and we’re beyond excited! What a beautiful house! It’s stunning what you’re doing. We have always bought houses that need gutted and redone them but this is the last one. I’m making sure my husband and I do it how we want because I don’t want to move again. Thank so much Joie! I don’t blame you for not wanting to move again. . . I’m starting to realize how exhausting it can be! Oh what a difference in wall coloring can make and the floors. This is so beautiful. I couldn’t agree more. . . it changes the space completely. Thanks for the comment Aimee! I know you’ll be happy to be moved in, even if everything isn’t finished yet. Learn anything new that you didn’t know how to do before buying this house? I’m so excited to be moved in! There’s a ton of thing we learned along the way. Especially when we put the IKEA kitchen together. I will definitely do a future post about it! Thanks for stopping by Betty! That kitchen looks so beautiful! Wow love the transformation. It’s getting there Meghan! Some days I wish the process went faster! Thanks for stopping by! wow, you did an amazing job. it looks so beautiful. Can you come do mine? Anytime Katrina ;p Thanks for stopping by! WOW! I like it. All that hard work is worth it. Where did you get boarder? Wish you lived in Chicago, I’d would hire you. LOL! Enjoy your Christmas in your new HOME. Lol Monica, that made my day 🙂 The baseboards are from a Canadian based company. If you’re still interested, send me an email and I’ll be more than happy to share. Thanks for the warm wishes!! Thanks Christin! It’s definitely frustrating at times but you’re right, it’s very rewarding in the end! Wow! Your home is already looking great! 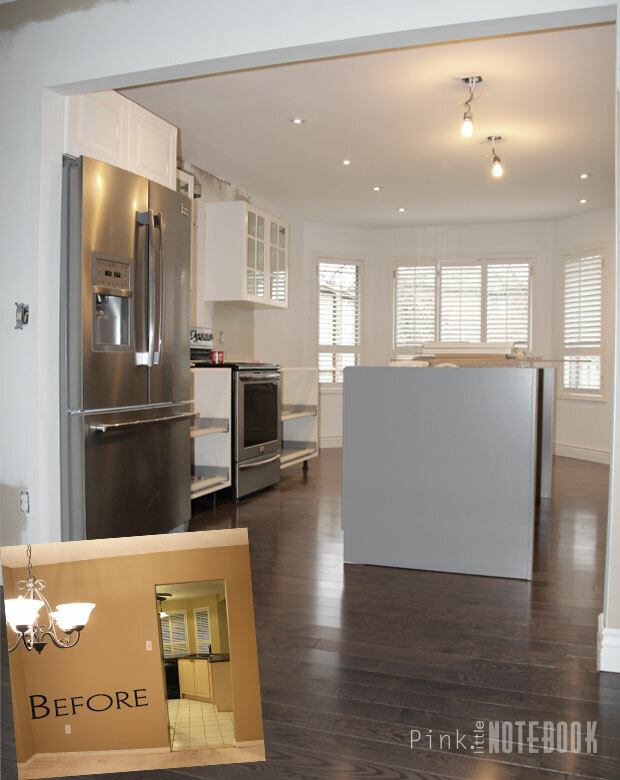 I love seeing the progress on your reno! It makes me look more forward to when I move out of my apartment and into a house of my own that I can renovate! Great post. Thanks for sharing!